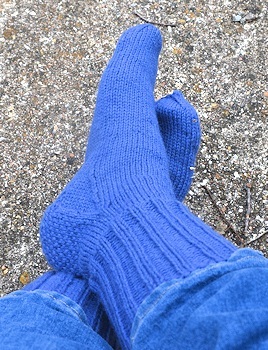 The rose socks (Plymouth Yarns Galway Nep, discontinued color) are past the ribbing and onto the plain knitting between the ribbed cuff and the heel flap. The pair after that is not fully on the needles yet (one is, with the ribbing started for stability. The other will be within a day or two. I can't put the second sock on the needles right now for LifeStuff reasons. It's my 50th pair and I chose a color type I haven't used yet: a brown/gold/orange heather. The yarn is Ella rae Classic #178. No pictures of these yet; they'll get their chance when they're done. That is the most beautiful blue! Thanks. It's one of those blues that changes a lot in different lights. When I took the picture on a cloudy day, it looked like that...on the clothesline at midday today it was lighter and also "flatter". I like all its moods. The rose socks are now both on the heel flaps, and I've started another pair, an interesting heather that can look either the brown of ground cloves, or much lighter, an orange-brown, like the inside of gingerbread. I may stripe it with a golden-green heathered yarn. I've discovered I can wear colors on my feet that next to my face make me look sick. (It also looks good next to a dark green and...oddly...turquoise.